I hope you are experiencing a bit cooler temps than we are here. It was 113 yesterday! And if you aren’t then I pray you all remain as cool as possible, and enjoy what is left of the summer. It seems heaven is having fun blessing me with a couple of more cottage warming blessings. As I was dropping off more boxes filled with donations to my local charity shop, I stayed inside for a while to cool off, and these delightful beauties called my name. 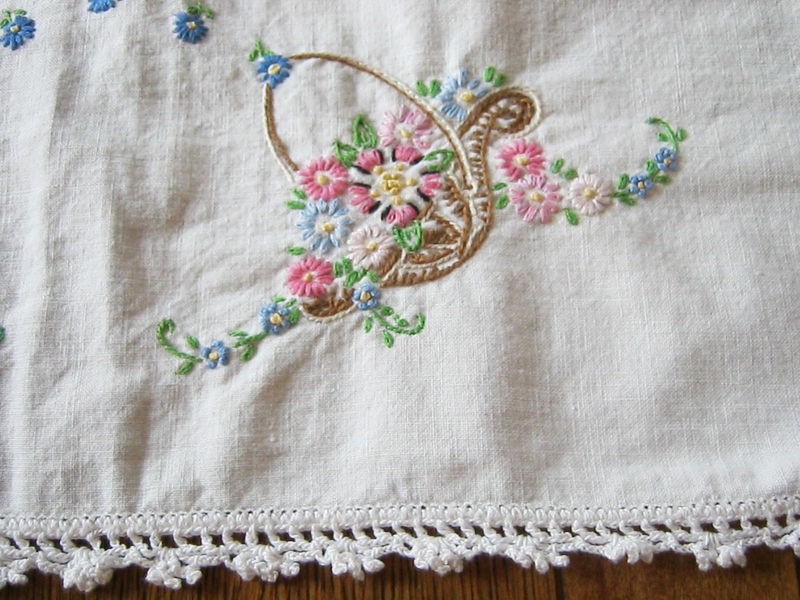 This dresser topper’s hand embroidered baskets of abundant flowers echo my feelings of abundant blessings. 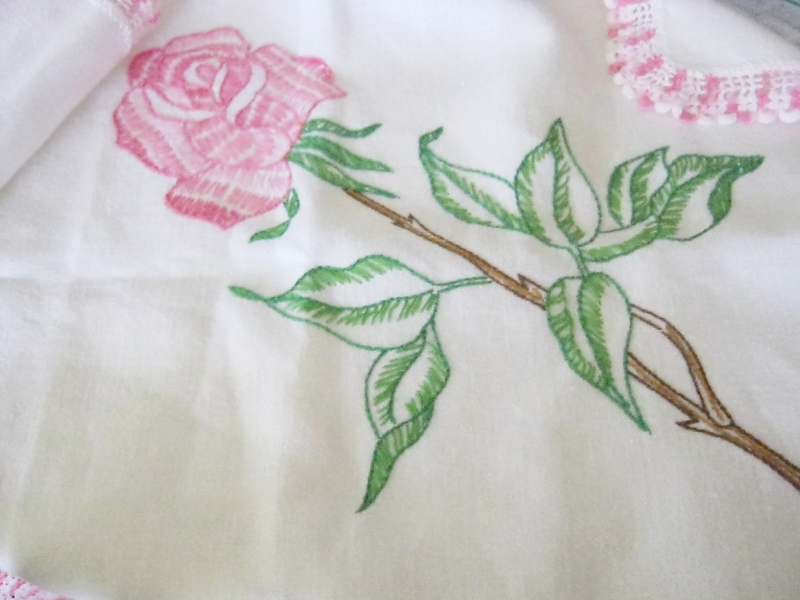 The colors are so pretty, and the crochet edging simply delights me. All the loving care that went into these will not be underestimated by me. The scallop sides add a graceful touch, don’t you think? 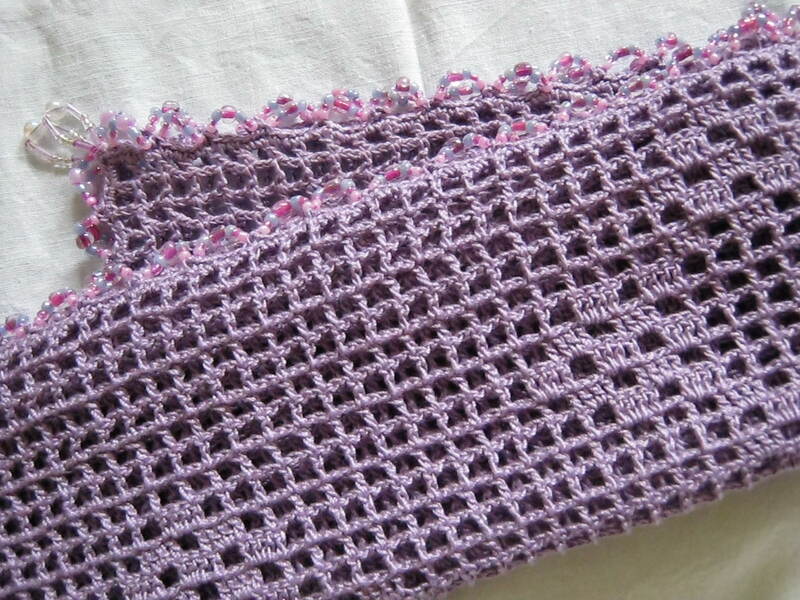 And this little beauty, is the exact color of two crocheted edged squared linens I bought once at a garage sale. 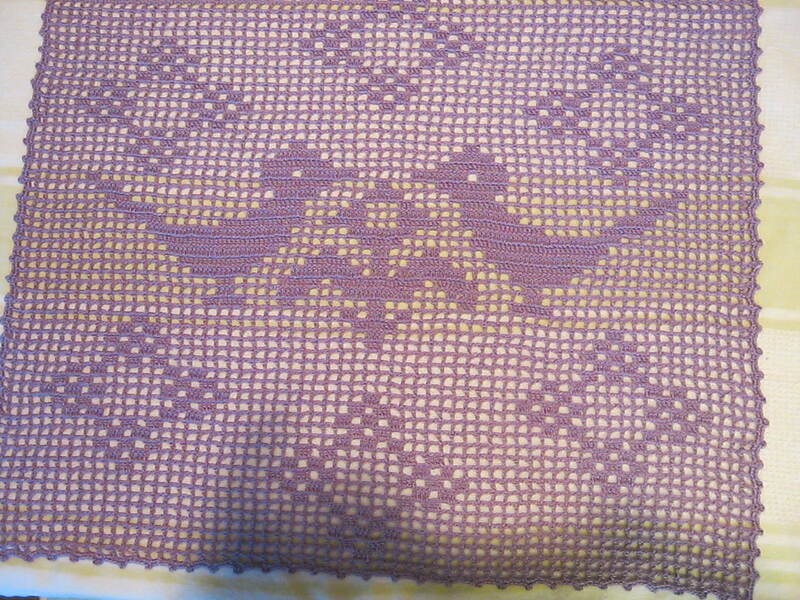 So it will match perfectly with them, especially with my autumn decor. These were such fun and pleasant little surprises, which I am so grateful for. 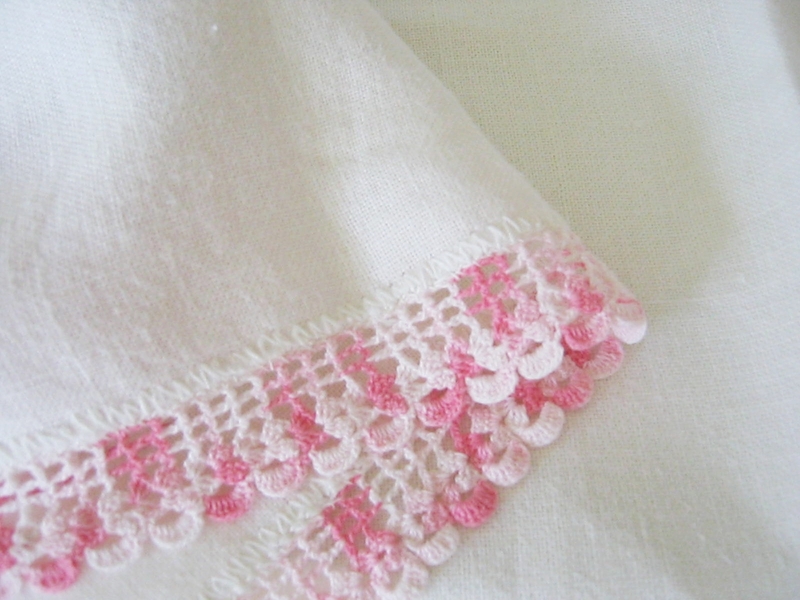 And all they need is a little gentle washing and blocking again so they can shine their best. Thank you for letting me share these with you today. I must get to my continued packing and organizing. I will be very busy with all of this for the next few weeks, so if I miss coming by your blogs, know that I am thinking of you, and will be visiting you as soon as I can. 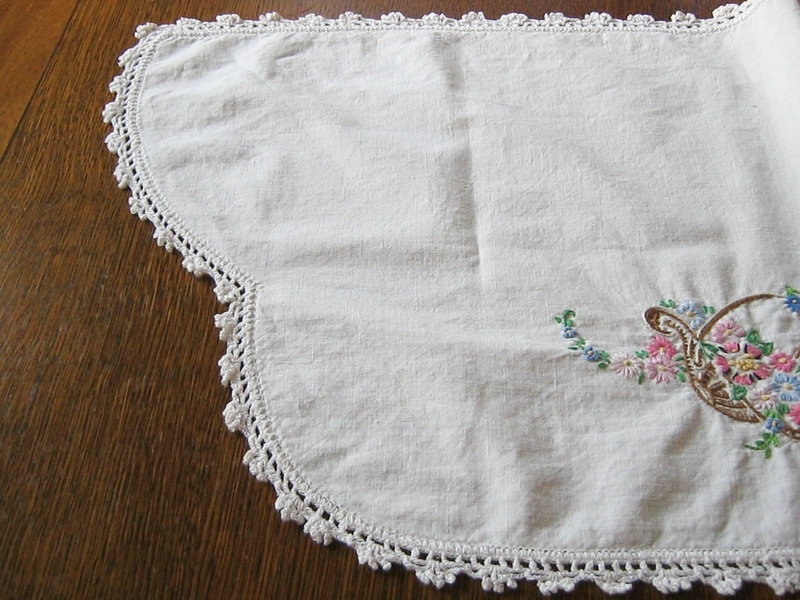 I’m so glad you are joining me today because I’d like to show you this lovely vintage table runner I found at my local thrift store. As you may know, I am making some changes in my life. At the moment I’m not sure where or when, but nevertheless, changes are on the horizon. So I’ve been cleaning and clearing out some things in my apartment. 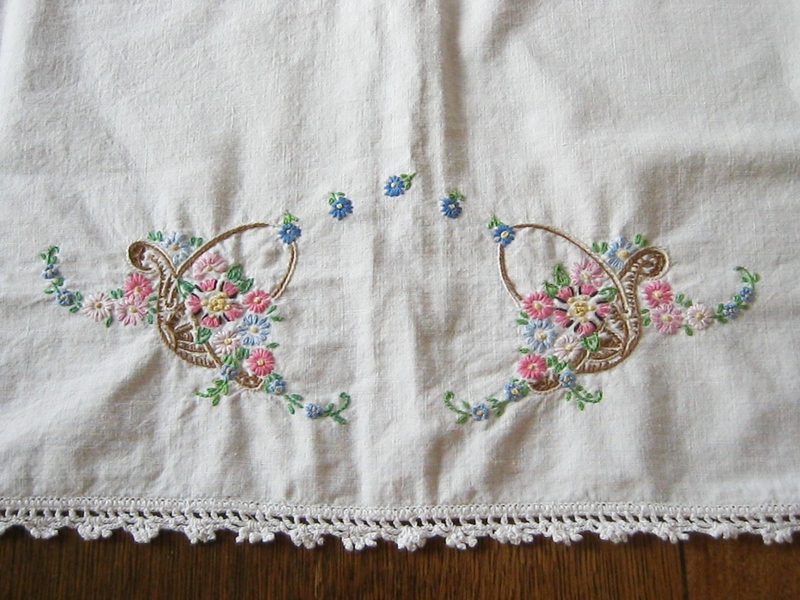 When I brought some items to the thrift store, I noticed this perfectly cheerful, hand embroidered vintage table runner. While I’m showing you some pretty things, here are the other cups I bought some time back at my local Tuesday Morning. If you missed the post with the first cup, you can view it here. 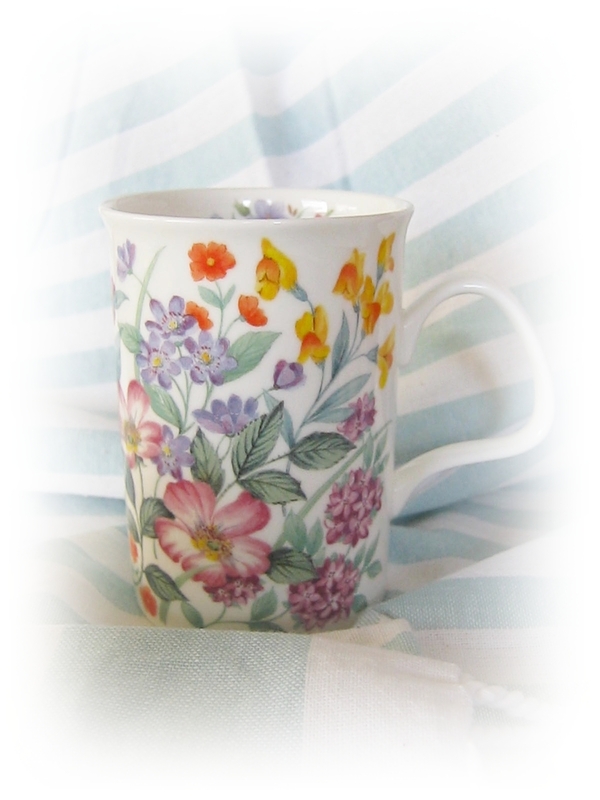 Love the colors and this also has the flowers inside the cup for cheery sipping. 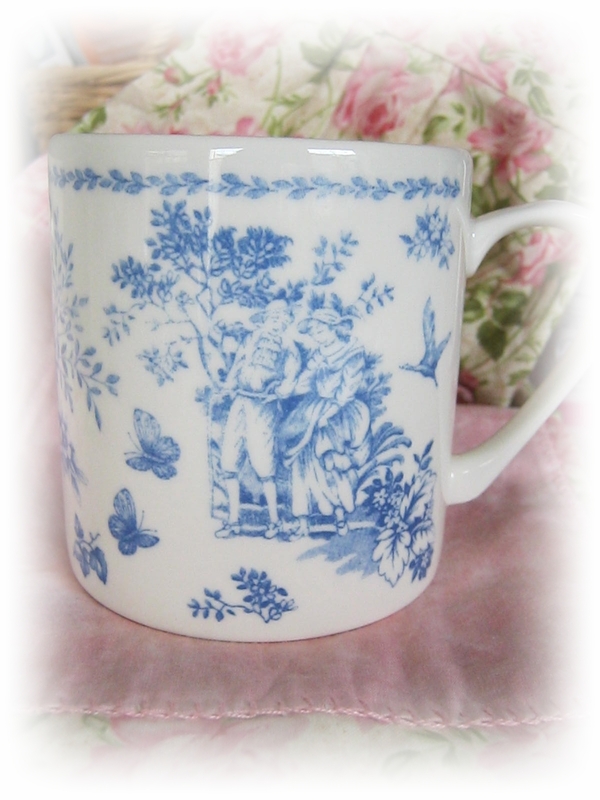 Although I’m not a wide mug person, I couldn’t resist this pretty thing with the blue toile look. 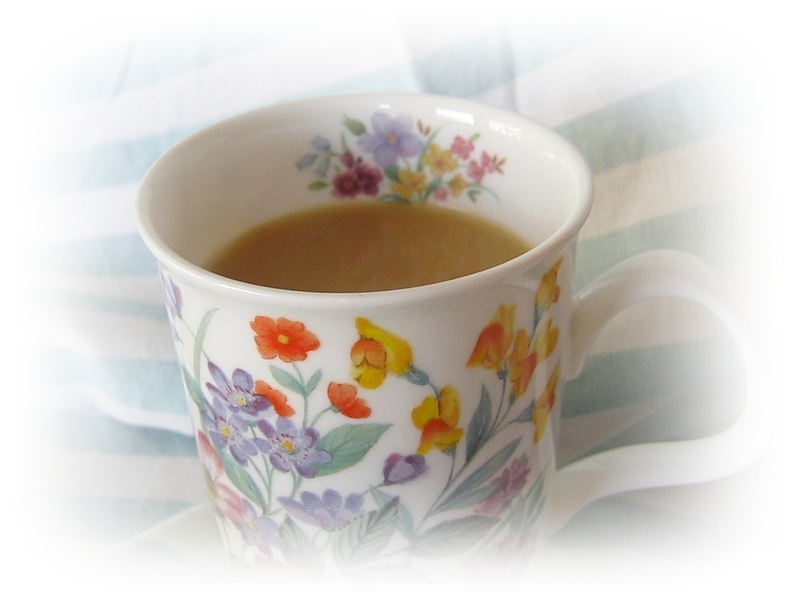 Both of these cups are made in England, and are such fun for me. Thank you for strolling by today. I hope you enjoyed your visit. I love hearing from you, so don’t be shy, and say ‘hello’. I’d like to say, “Welcome”, to my new followers. 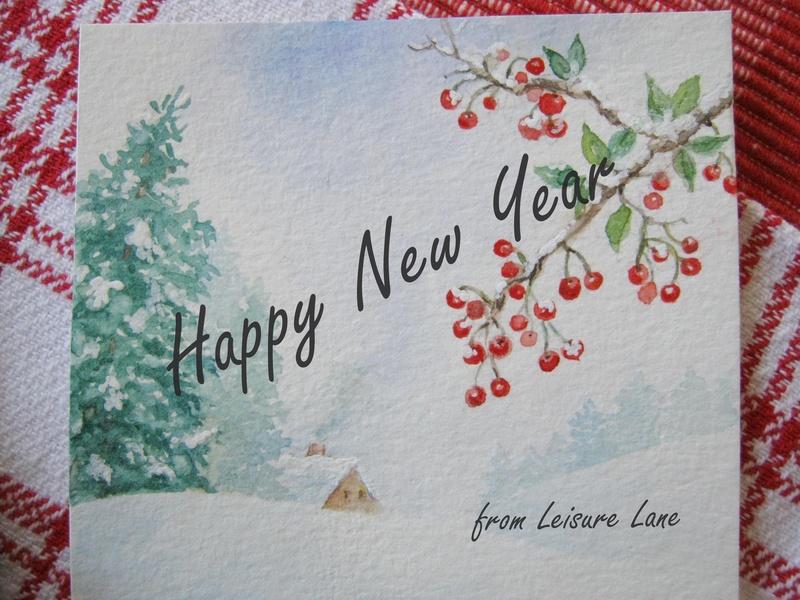 I hope your strolls by Leisure Lane are always leisurely and pleasant. Lately I’d been sending her all sorts of beautiful purple pics I’d see on Pinterest…so much so, that I decided to create boards just for her and her purple loving life. Denise’s Favorites, The Garden of Her Purple Life, and Clothes That Get Her Purple On. If you love purple, too, you’ll love these boards. 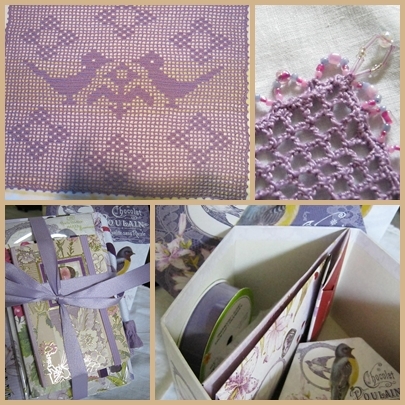 So when it came time to collect fun things for her birthday this July, I knew I wanted to give her the purple she’s always desired, and I was blessed to find so many purple sensations to please her fancy. 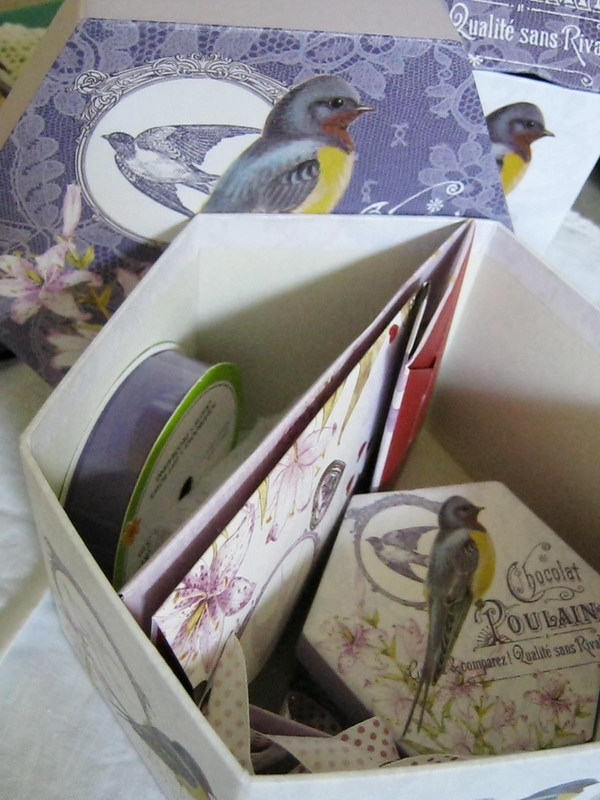 I filled this box with matching gift bag, and smaller boxes, and pretty ribbon. My sister is a most giving person, and she’ll find use for these items, I’m sure. 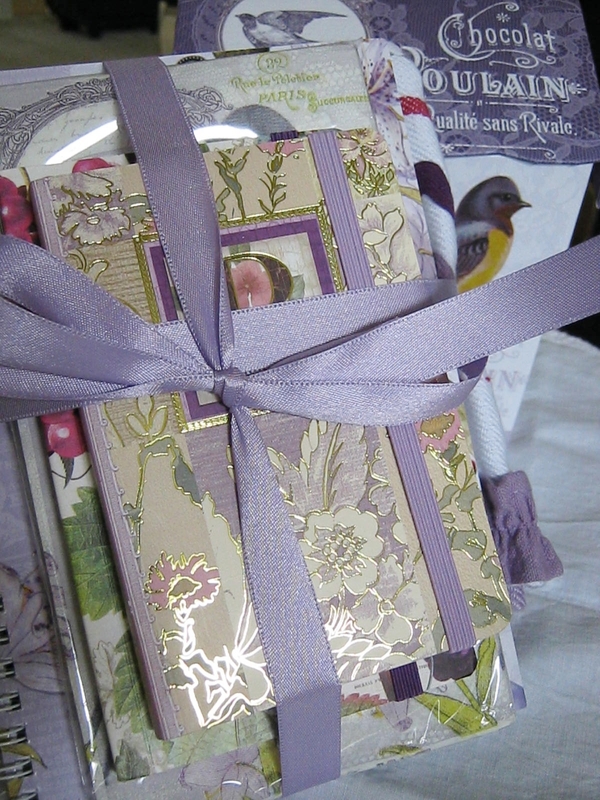 A few lovely journals (one that matches the boxes, lovely napkins of the same design, perfectly happy and decorative kitchen towels I found at Tuesday Morning all wrapped up with a pretty lavender bow are sure to make her smile. 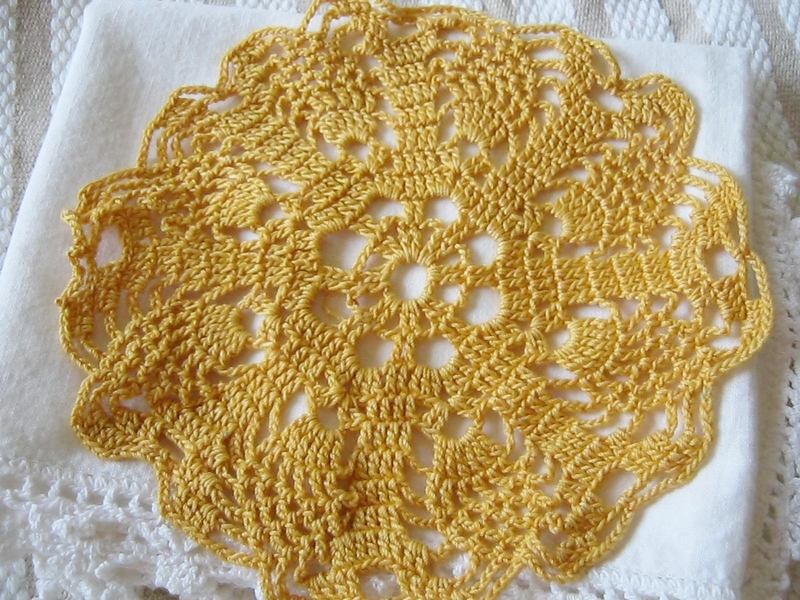 The last gift, which took a bit longer for me to accomplish is this fillet crocheted square doily. 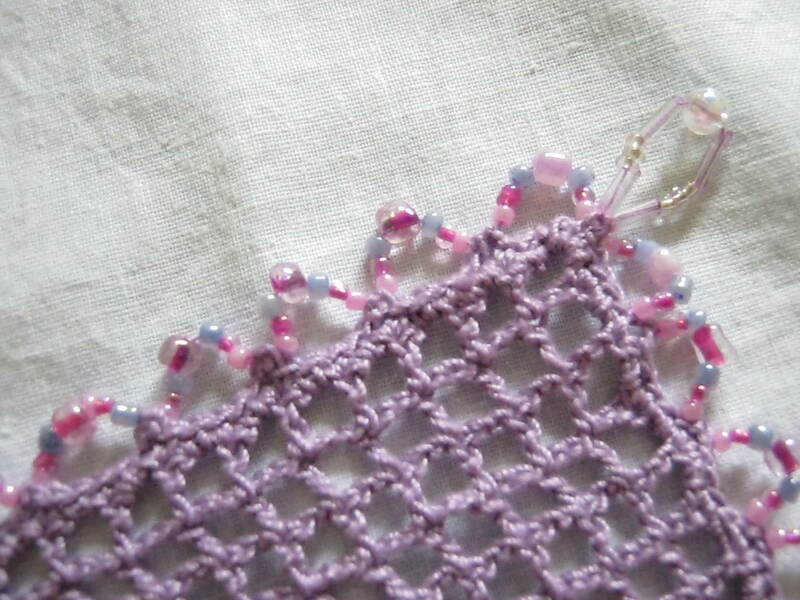 The picot edging is pretty on its own, but I decided to add beading. 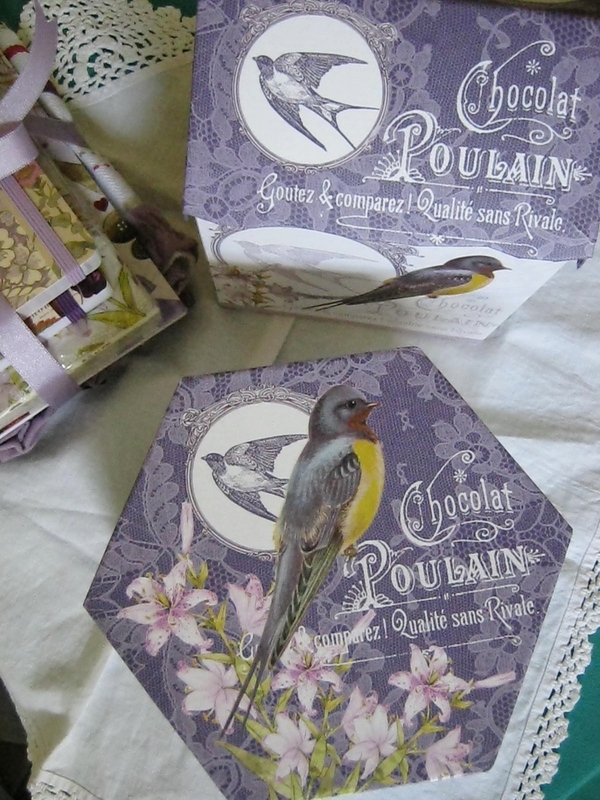 I folded it neatly and put it inside of the birdhouse box along with a couple of other goodies. Now to pack it all up and off to the post office. Her gift is a bit late, but she celebrates birthday month nowadays, so though I missed her early July birthday, I’m still good. I’m so excited about her receiving it, you’d think it was my birthday! Well, that’s my happy post for the day. I hope you enjoyed it. And I hope you surround yourself with your favorite colors, aromas, and sounds. Because of friends… our mail boxes are more cheerful, our birthdays are happier, and our hearts more likely to shine on a rainy day. Because of friends…our tears don’t fall alone, our laughter is heartier, and our days have more purpose. Because of friends…a movie is more interesting, an outing more exciting, and a caffè latte more flavorful. Because of friends…the moon seems bigger, the stars twinkle more, and a sunset is more glorious. Because of friends…we have more memories, we smile more often, and our lives are more colorful. Friends, no matter how many or how few, how far or how near, are treasures worth cherishing. Thank you, my friends, for joining me today. I hope you are having a joyous day. If this made you think of a friend, drop him a note, or give her a call. Note: Prose by Marianne Coyne ©2012. Above illustration by Maud Humphrey. The day after posting the above mentioned article I logged onto my Pinterest account. As I scrolled down my main page I saw nary a promoted pin – all the way down to the bottom! No new promoted pins in sight. I was thrilled and pleasantly surprised. The next day my main feed page was still clean of unwanted pins. I have received two, on separate days, since the article, but dealt with them accordingly, and all was well again in Pinterest land. Well, that’s my update. I’m so happy you decided to stroll by and visit today. 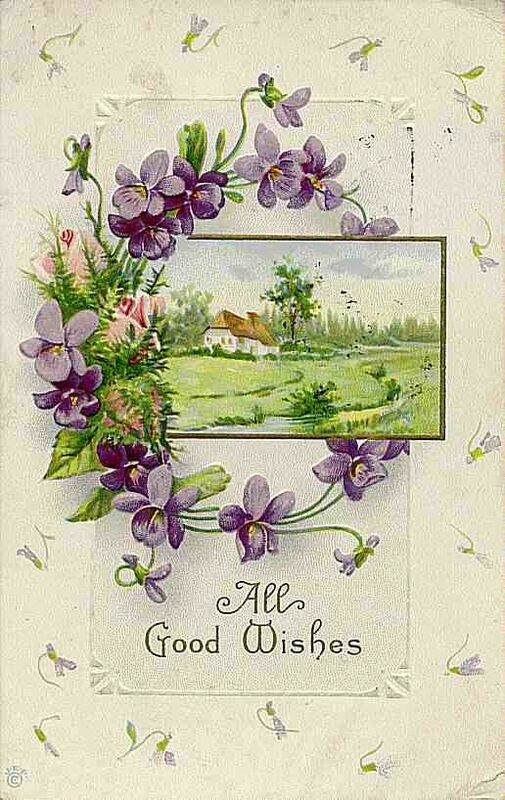 I hope all is well in your neck of the woods, and as the above image suggests, I truly do send you all good wishes. Thank you for joining me here at Leisure Lane. I hope you enjoy your visit. These are fun and relaxing to do at the end of the day, and I would encourage anyone to try it. Just jotting down or doodling or both anything that comes to mind. Something cheery for the heart to ponder, and to fall asleep by; grace for the soul. Well, I hope you enjoyed them, and something spoke to you from this page. Just a reminder about my Kindle book giveaways, of The Heart of Annie…The Strength of God. TWO lucky winners will be picked in the June 25th drawing. If you haven’t read about it, and you’d like to enter, click here and leave a comment letting me know before June 25th 8:00 am CST. 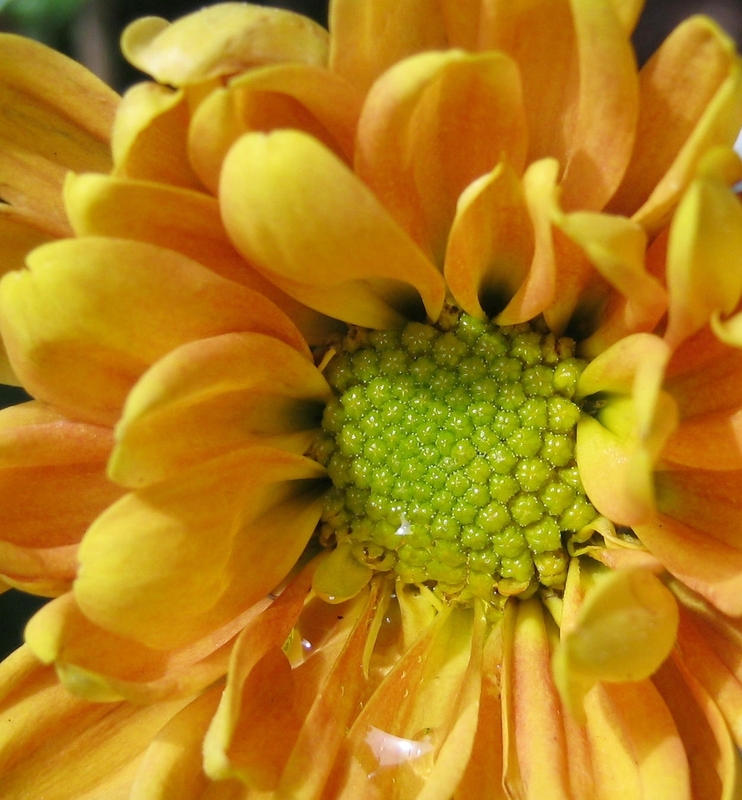 May your day be filled with pretty things, and…Until next time, may happy days abound! God Moments…you know the ones I’m talking about. When you’re in God’s Place and things just keep getting better during the day. Or maybe you’re not in that special place where grace flows, but someone else is, and they’re the conduit for God to get His grace to you anyway. I had one of those moments two days ago. I was in a hurry that day, so I didn’t take the time put on my spiritual armor – get my mind in line with the mind of God. As I entered into work and immediately met with every negative aspect there, I wasn’t able to filter it out. Needless to say, I internally fell apart, which in turn recruited me as part of the negative energy there. I began to mumble, to complain and blame…it was an awful feeling because I knew that I was contributing to the chaotic ‘mind’ there. Then it hit me! I decided to start my day all over again. I went outside and stood in the sunlight. Away from from the din and the bad moods, I began to pray. Not in the conventional sense, but just to speak to God. I acknowledged His love for me, and blessings toward me. Then I decided that since the NOW is the point of power, where God dwells, then now in that moment is where I would begin my new day. 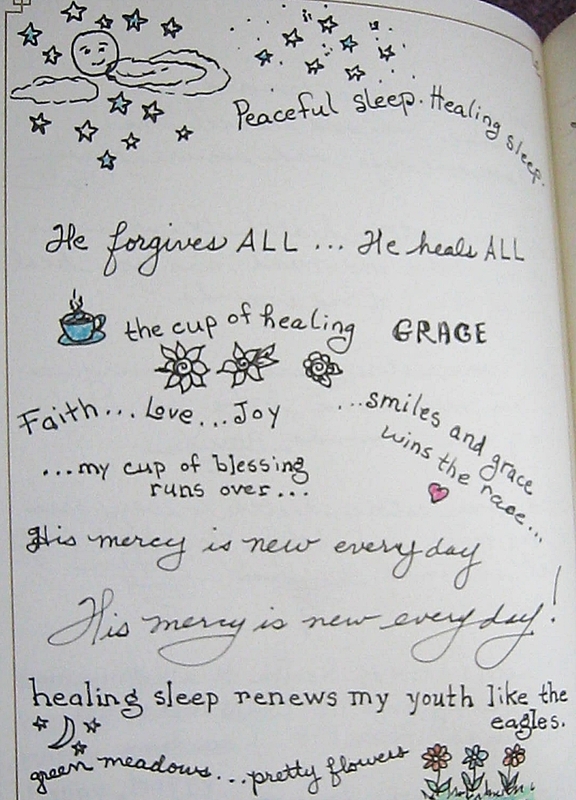 I released all the past including the last 20 minutes, forgave myself, and breathed in the moment of my new day. 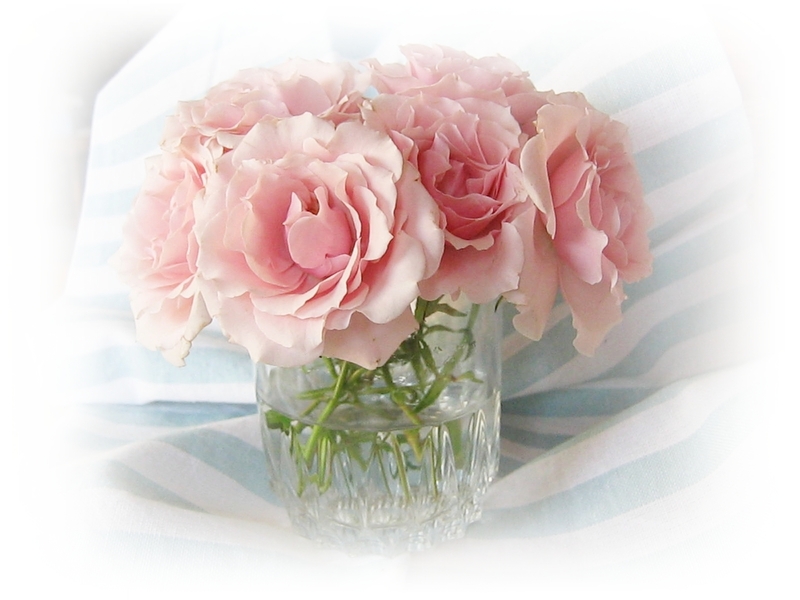 As I re-entered the store, I noticed a woman standing by the miniature roses. I began to speak with her. I told her that the pink roses are the ones that usually have the rose fragrance. Then, I don’t know why – perhaps I felt so elated I wanted to share it with someone-I began to tell her what had happened and how I turned it around. She looked me in the eyes, and said, “Thank you, I needed to hear that today.” Then I told her that I often stop when I pass the flowers to smell their sweet scents to remind myself of the joys in life. 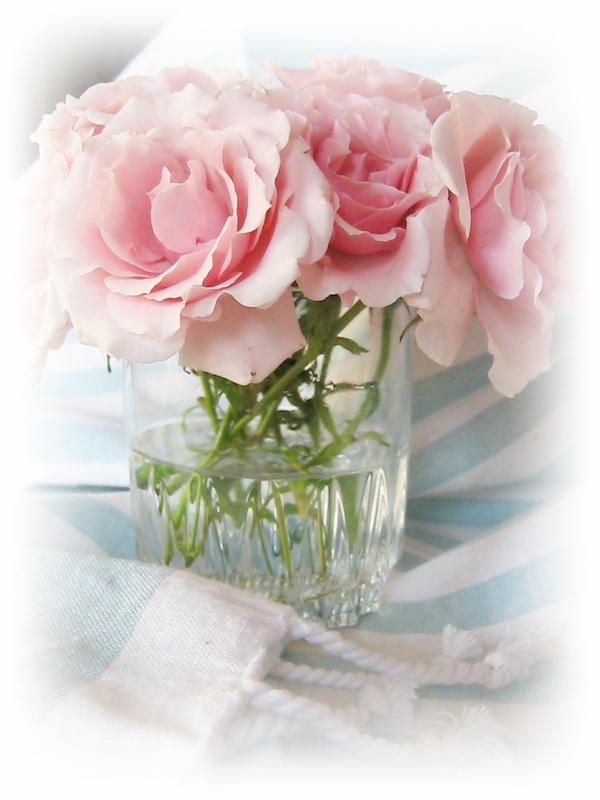 “And you see,” I added, “I came back in from my prayer, and I saw these pretty flowers and your lovely face.” I decided to leave her alone, lest I overstay my good intentions, and as I walked away, I noticed she picked up two bunches of the miniature roses – cream and pink. A while after that, as I stood by my demo cart, the same woman came up to me. She had already checked out. I thought she wanted a sample, but instead she took the pink bunch of roses and handed them to me. “These are for you,” she said. I was so surprised, that at first I began to decline the gesture – you know that strange refusal that we think is humility. But she gently insisted, and my eyes began to tear as I took them into my hands. “Thank you,” I said. “You made my day.” I hugged her as she told me that she really needed to hear what I had shared with her earlier, and that it was a God moment. I agreed. I thanked her again, and she went on her way. So you can see how it is never too late to begin your day over. Any moment is the right time to do so, if you are feeling out of sorts. We must not let the world pluck us out of the Garden of God. But if it does, it’s never too late to replant ourselves where our roots will run deeper for the experience. God is ever willing to prune off the wilted part where the world roughly handled, and water us with His divine love and tender mercies. And how refreshing that is! In my old mindset I would have said that I was suppose to have been in a bad mood, because that is what made me meet those two lovely ladies, and things lined up – that some bad things happen so that good things can come from them. And there may be moments when inconvenient, or what we perceive to be bad things, happen for the good of something. That’s a whole topic for a different time. But I believe, for the most part, that bad things happen because bad choices are made somewhere by someone. I believe that, in this situation, things lined up because I chose to get back into the God place…the place where all possibilities are born. By doing that I removed spiritual obstacles, and opened the door to blessings. By the way, the color of the roses she gave me, as you can see above, was the exact color I would have chosen. And they’ve blossomed fully, just as I plan to do. Oh, they make me smile as I remember that kind woman. May your day be filled with blessings and God moments, and if you are feeling out of sorts, just go to a quite place, begin your day anew, and turn it around. Because God wants you blooming in His garden. 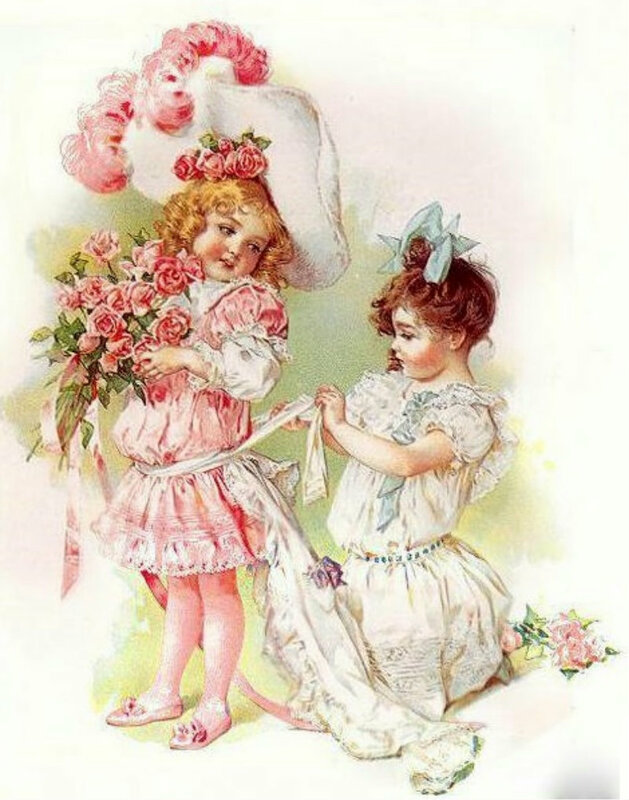 I certainly hope you are all experiencing a delightful day in one way or another. As I may have mentioned before, every evening I’ve been writing in my gratitude journal, which also turned out to be an affirmation journal. I seem to evolve in how and what I write in them. My latest journal book was given to me by my sweet neighbor. 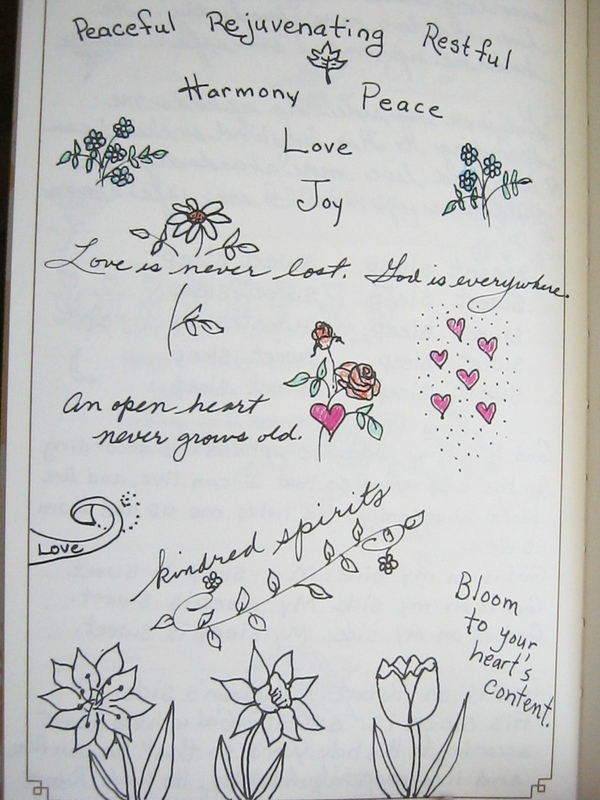 I love that it has a blank page on the left for drawing or special sayings, and a lined page on the right for writing. I’ve decided to share some of my doodles, if you will…things that come to mind that evening. This part relaxes me very much, and it’s during the doodling that I really release the angst of work. I hope in my sharing some of my pages, you can glean something that will inspire you, or bring you joy. And I hope that your day is filled with happy thoughts and peace of mind. Welcome to Leisure Lane, and thank you for strolling by to visit. A quick post to let you know how much I appreciate all of you. I hope today you come to know the things that make you THRIVE with joy and contentment, and to treat them as the precious jewels they are.